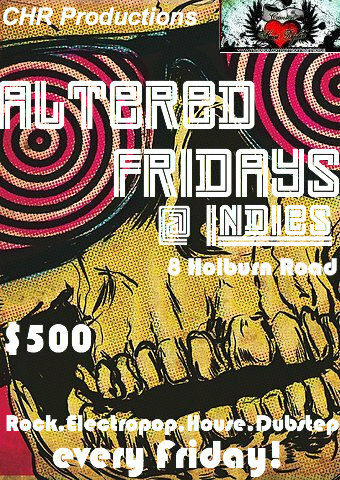 CHR Productions presents ALTERED FRIDAYS, every Friday at Indies, a YardEdge ENDORSED EVENT! Described as “the ultimate alternative club experience”, Altered Fridays, offers Metal, Alternative, Classic Rock, House, Electro Pop, Industrial and Trance music in a club atmosphere. PLUS, every fourth Friday will feature live music performed by some of Jamaica’s leading “alternative” artistes. Patrons are able to party in an ALTERED state, so check it out if you live for Rock n Roll, and think outside the box! Eat some food. Drink some booze. Dance all night! See YardEdge interview with Crimson Heart Replica 2 Minutes with Crimson Heart Replica and search our archives for much more on CHR.